Population of 1.5 million inhabitants. Barcelona is Spain's second biggest city, and the capital of the autonomous region of Catalonia. Barcelona is on the north-east coast of Spain. 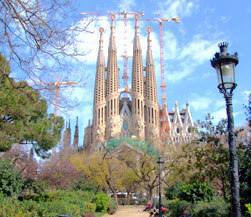 Barcelona has fantastic transport links with the rest of Spain, as well as internationally. Barcelona enjoys a world-renowned reputation for its culture, architecture and ambience of the city. As Spain's second biggest city and Catalonia's capital, Barcelona is definitely worth a visit. Despite Catalan being an official language in the region, Castillian Spanish is still used and understood all over the region. The actual city is home to over 1.5 million people, but when including the outlying areas, the number is over 4,000,000. Barcelona not only enjoys the benefits of being right on the coast with its beaches and marinas, but has a cosmopolitan atmosphere where shopping and bars/restaurants are plenty, as well as a cultural heritage including museums, galleries and beautiful architecture. Barcelona is a true Mediterranean city; its seaside location and its cultural heritage make up just part of the attraction of Barcelona. The city actually dates all the way back to the 2nd Century, when a Roman colony was founded there. 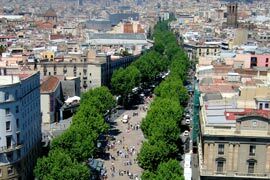 Barcelona later experienced an economic boom thanks to the city's industrialization around the end of the 1800s, when artisans, architects and industrialists began to shape the city. The 1888 World's Fair came to symbolize Barcelona's international influence and its commitment to hard work. 1889 saw the foundation of the city's world famous football club. Barcelona offers a unique combination of both rich cultural history and metropolitan modernity. Barcelona has beautiful parks and it has preserved its beautiful Gothic centre. 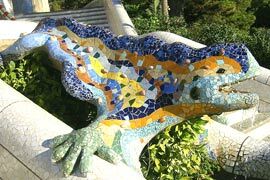 Many of Gaudi's most famous works are found here and have become popular tourist destinations. Barcelona's unique charm however is felt all over the city, with its vibrant nightlife sitting alongside the tranquil coast. 'Els Castellets', human tower performances are very traditional to Catalonia. Castells means 'castle' in Catalan. The smallest Casteller will climb to the top of a tower of up to nine people high (with a very solid base!) and will then raise their hand with four fingers splayed, representing the flag of Catalonia. 'El Correfoc', or 'diablos y demonios' as it is called in Spanish, means "devils and demons". The people of Barcelona flood the streets of the city dressed as demons under the explosion of fireworks. September 24th is when revelers enjoy music concerts and a huge fireworks display at 10pm which signals the end of the festivities.